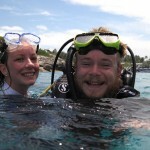 Your experience diving in Phuket can be very different depending on whom you go diving with. While prices are slightly different the quality of the experience can differ to a very great degree. We have always offered dives with a duration of 1 hour and our guides work very hard to help you all to reach the maximum dive time. This can be by offering you a bigger tank or by helping with your buoyancy control or just simply slowing down under water and diving a more shallow dive profile. We do realize that most of our divers are holiday divers and are not diving all the time so we guide all divers in small groups of 5 guests per guide or less. We also offer a scuba review on our boat for those that have not been in the water for a while to get them comfortable under water again. We do not allow our guides to take cameras and sell guests the pictures after the dive. Some of the guests may not agree but we find it important the guide is concentrating on the guest and showing them what’s there to see rather than ignoring the guests and taking pictures to sell afterwards. Altogether the price was only a little cheaper but the value for money the guest got in this instance was a lot less. Have a look at what’s really offered and decide for yourself, but in our opinion spending a little less but having a bad day because of it means you just wasted the money. The general rule in business that you get what you pay for is trough in diving as well. You cannot expect the same level of service, safety and comfort for a much lower price. That’s simply not realistic. The only way to have a much lower price is by putting a greater number of customers on the boat, using less expensive or even unqualified guides, safe on Safety equipment (yes, there are still boats out there without oxygen) and on maintenance. You are on vacation and you want to enjoy your dive day. We know it is not cheap to dive in Phuket due to the distances and the logistic involved but still, spend a little more and have a great day rather than wasting you money on a sub standard operator. There are several good boats and operators out there all it takes is looking around a little to finds them. The first question you need to ask is:” do you own your own boat?” Most dive shops in Phuket do not own a boat and will book you on a “cattle boat” with a very low price (for them and not necessary for you) to maximize their profit acting only as a booking agent and not being responsible for the trip you take at all. As a rule, book with the boat owner and operator directly and stay away from the lower end of the pricing spectrum. Spend a few minutes talking with them and finding out how guiding in board is regulated. Are guides allowed to take a camera or not? How long is the allowed dive time, how long are the surface intervals? What all is included in the price or rather what will I be charged extra on board if at all? There are many questions you can ask and some that you will probably not get a good and honest answer for but asking about Oxygen on board should be not be necessary but as we recently discovered is a must again. Go diving and have a great day doing so. After all you are on vacation and deserve to have a good day.